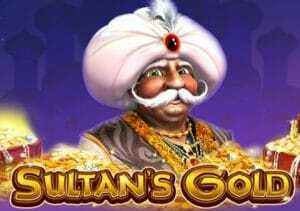 Sultan’s Gold is a 5 reel 20 payline video slot powered by Playtech software. It has sumptuous purple and gold colour scheme and is glittered with jewels as it’s based on the opulence of the Middle East. The game comes with a great free spins feature which is described below. Anyway, you can play from 20p a spin to £40 a spin. Look out for the Sultan himself as 5 Sultan symbols will reward you with 5,000 times your stake. The other symbol to obtain is the Template scatter which is the wild symbol as well. If you get 3 or more Template scatters anywhere on the reels, you will trigger the Free Games feature. The Free Games feature will then give you 10 free spins with a Mystery Scatter. One symbol (except for the Temple scatter) is randomly chosen before the free spins begin. Every time it appears, it will act like a scatter to give you bigger wins. You will see a Mystery Scatter box at the top of the reels which displays if you get 3 scatters, you will win 5 times your stake, 25 times your stake if you get 4 scatters and 100 times your stake if you get 5 scatters. Now, if you get 3 or more Temple scatters during the free spins, you will be awarded an extra 10 free spins. The number of free spins you can subsequently get is unlimited. Sultan’s Gold is all about the Free Games feature – I’ve played this game quite a few times now and I’ve won over 350 times my stake in the feature on 2 occasions. Maybe I’ve got lucky but this game seems to be good to me. It’s an extremely high variance slot to be careful – I’ve played enough times and it’s eaten up my bankroll. If you like volatile slots, you should check out Great Blue by Playtech or Immortal Romance by Microgaming. As mentioned, you need to play carefully so that you’re not out of pocket quicker than you think. If you do get a huge win, I recommend you cash out or play another slot because big wins won’t come along often.